"Can beer help me gain weight?" is a query that many slim / thin men ask dietitians. My answer - of course, it can! 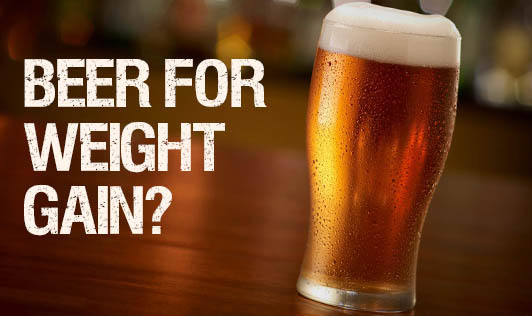 But is it necessary to drink beer in order to increase weight - definitely not! Although beer has much less alcohol content when compared to spirits, the usual consumption of beer is much higher (in terms of quantity) than spirits. So, not only does the calorie intake increase, but other effects of alcohol are there too. Along with weight gain, high intake of alcohol can affect other parts of the body (especially the liver). If you are already a beer drinker, take it in small quantities, occasionally. If you are not a beer drinker there's no need to start drinking it for weight gain. Weight training and carbohydrates will help you gain weight in a much healthier way.